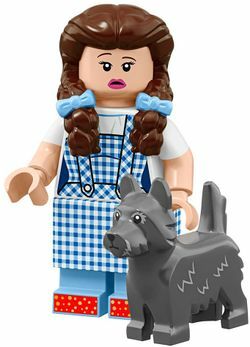 Dorothy Gale is a The LEGO Movie 2 collectable minifigure released in 2019, based on the main character in The Wizard of Oz. She first appeared as a video game character in Dimensions in 2015. Dorothy is based on Judy Garland's portrayal of the character. Dorothy has reddish brown hair, it is split towards the centre. The hair indents at each side to create an appearance of an ear. Her hair is tied by medium azure ribbons and it flows down to around the top of her torso. Dorothy has light nougat skin. She has thin reddish brown eyebrows over her black eyes. Out of each her eyes there's two curved upwards eyelashes. Inside each of her eyes there's a white pupil. She has a smiling mouth outlined in bright red lipstick. Her torso is based on a medium azure colour. At the top there's a large white rectangle. There's diagonal straps going from each top corner down the majority of the torso. The straps are printed with white and medium azure gingham design, and they have a black outlined button at the end. Underneath the rectangle of white there's a double line with more medium azure and white gingham design in between. There's another double line medium azure and white gingham design in between at the bottom of the straps. In between the double lines and underneath the bottom there's additional medium azure and white gingham design. The sides of her torso are printed with earth blue feminine curves. To recreate her medium length sleeves Dorothy's arms are white at the top and light nougat at the bottom half. Her hands are also light nougat. 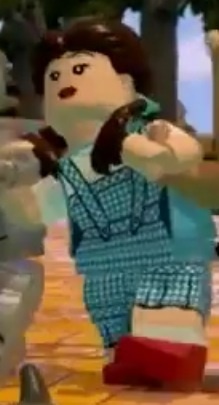 The medium azure and white gingham printing of Dorothy's torso continues onto her legs and go down half way. There are three black lines to represent creases on each leg and a black curved line underneath to finish the dress look. Dorothy's legs are then light nougat up until her rectangular white socks. Underneath her socks she wears bright red shoes to represent the ruby slippers. The printing on the front of legs continues to the sides. Dorothy Gale is the 12 year old adopted daughter of the farmers Emily and Henry Gale and owner of Toto. One day Dorothy runs home with Toto at her side as Toto bit Ms. Gulch. Dorothy walks around the farm complaining about Ms. Gulch to her adoptive patents. When they don't listen she tells her friends the farmer workmen, and they tell her to use her brain, heart, and courage against Ms. Gulch. Ms. Gulch angrily comes into the farm with a document conforming she can take Toto into her custody. Dorothy is devastated by this and runs into her room crying. Toto escapes Ms. Gulch's clutches and runs home to Dorothy. Dorothy decides she must run away with Toto to a place they'll be safe. She meets a fortune teller a long the way and he tells her she must return to her family as they're missing her and sick. Dorothy rushes home in the middle of a twister. When the cellar door won't open up she rushes into her house, into her bedroom. Dorothy knocks her head and when woken up she sees the inside of the tornado, including Ms. Gulch who is turning into a witch. When the house lands Dorothy comes out of it and sees a world of colour, she has landed in Munchkin county in the World of Oz. Glinda the Good Witch of the North thanks Dorothy as she has killed the Wicked Witch of the East. Glinda then calls on the munchkins and tells them it's safe to come out as Dorothy's house has landed on the person who was enslaving them for so long. The munchkins celebrate and thank Dorothy until the Wicked Witch of the West appears. The Wicked Witch of the West is furious about the fact that someone has killed her sister. When she finds out its Dorothy she's about to attack until Glinda reminds her about the ruby slippers. The Wicked Witch of the West checks the feet of the house but can't find the shoes. Glinda reveals she has put them on Dorothy's feet. The Wicked Witch of the West asks Dorothy for the slippers but she refuses to hand them over. The Wicked Witch of the West swears she'll catch Dorothy and her dog soon and leaves, as she's threatened by Glinda's power. Dorothy then asks Glinda how does she get home as she can't go the way she came. Glinda suggests that she should ask the Wizard of Oz in the Emerald City, as he'll sure know what to do with all his power. 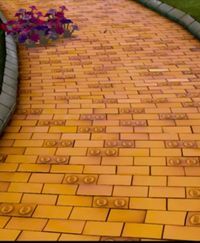 Dorothy asks how she'll get to the Emerald City and Glinda tells her all she has to do is follow the yellow brick road, which she does. After traveling for a while Dorothy comes at a crossroad and doesn't know which way to go. She then hears a voice she figures out is from the Scarecrow behind her. She unites the Scarecrow and he thanks her. He tells her about how he doesn't have a brain and Dorothy suggests he comes with her down the yellow brick road and he can ask the Wizard for a brain. Excited the Scarecrow excepts and the two sing down the path together. Later in the journey they get hungry and decide to pick some apples. The trees who they picked the apples from are angry that they picked apples if them and they start pelting apples at the two. The two seek cover beside a tin man. The Tin Man starts murmuring and Dorothy discovers he wants oil as he's rusted. Dorothy finds his oil can and looses his joints. The tin man thanks Dorothy and tells her about he doesn't have a heart, Dorothy assumes the wizard will be able to give the Tin Man a heart. She invites him on the journey to the Emerald City with herself, The Scarecrow and Toto and he accepts. The four meet the Wicked Witch of the West when they start walking but quickly avoid her. When they're in the woods the four get attacked by a lion. When the Lion chases Toto Dorothy slaps his nose, which makes him start crying. Dorothy calls him a coward and he starts apologising and claims he doesn't have any courage. Feeling bad for him Dorothy invited him along for the trip and he agrees. The five now sing and skip down the yellow brick road. When they see the Emerald City they are over joyed and run straight for it. When they run in the poppies Dorothy and the Lion fall asleep as the flowers are enchanted by the Wicked Witch of the West. They are quickly woken up by snow casted by Glinda. The five find it hard to convince the guard to let them inside the gates but end up doing so by showing him Dorothy's ruby slippers. They are then treated by the people of the city who give them makeovers. After being pampered the five are terrified when they see the Wicked Witch of the West write "Surrender Dorothy" in the sky. They quickly run off to ask the Wizard for help, he says he'll help them if they bring him the broomstick of the Wicked Witch of the West. The five are extremely scared when they're walking towards the castle of the Wicked Witch of the West's castle. The Wicked Witch's winged monkeys then attack and kidnap Dorothy and Toto. The Wicked Witch of the West gives Dorothy a few minutes to live and Dorothy breaks into a cry. Toto escapes and bring The Lion, The Scarecrow and The Tin Man who help rescue Dorothy. The Wicked Witch of the West and her winkies chase after them. When they catch them the Wicked Witch of the West decides to kill them off one by one, she starts with The Scarecrow and lights him on fire. Dorothy saves him with a near by water bucket and ends up drenching the witch as well, which causes to melt. The winkies thank Dorothy for killing their enslaver and give her the broomstick. When the five return to the Wizard he is shocked, Toto figures out the Wizard is really just a human. The Wizard gives the Tin Man a clock heart, The Scarecrow a certificate of intelligent, and the Lion a certificate of courage. The Wizard then tells Dorothy he is also from Kansas and invites her and Toto with him on a return trip to Kansas, which they accept. Dorothy hugs her friends before she leaves. When Toto runs out of the balloon she follows him which causes the balloon to leave without them. Glinda then appears and tells Dorothy that the ruby slippers will send her and Toto home, which they do. Dorothy then is sent home and she wakes up. Dorothy is told by her family and friends she was dreaming but she is convinced it really happened. Dorothy ends up not minding what happened she's just happy she's home. This page was last edited on 26 March 2019, at 09:17.